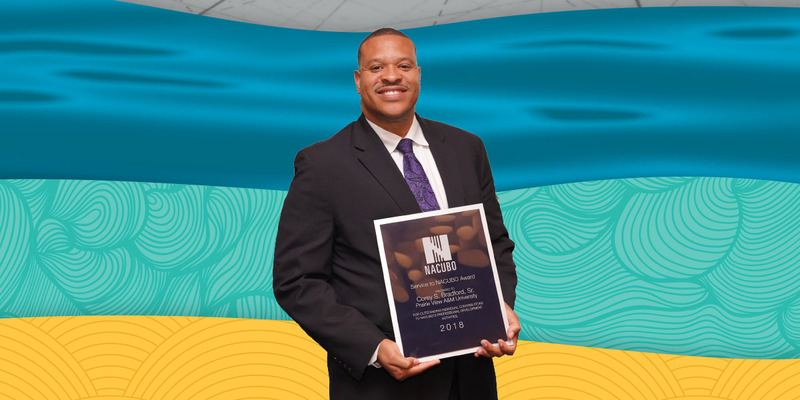 Corey S. Bradford Sr., recipient of the 2018 Service to NACUBO Award, shares how humility and gratitude can help leaders achieve success. In a recent interview with Business Officer, Bradford shared his personal and professional philosophies for life and leadership. You are currently serving on an informal advisory group for the NACUBO 2019 Annual Meeting that focuses on programming for minority-serving institutions. How will this programming be different from other learning opportunities at the conference? The focus is different. Minority-serving institutions typically have a unique mission: to serve the underserved or the underprivileged. Consequently, these institutions face challenges that many competing institutions do not. Minority-serving institutions may have an open admissions policy, which can result in more at-risk students within the student body population. There are a lot more challenges when you’re dealing with thousands of at-risk students, versus a few hundred. In addition, states have historically underfunded minority-serving institutions, creating fiscal challenges that top research institutions do not face. We all deal with fiscal challenges, but when you are severely underfunded, it makes the challenge even greater. This is not just a one-year state funding issue of not having received an appropriation. There is a historic trend of underfunding minority-serving institutions. Tell us about The Business of the University Conference, which you helped create and launch in 2016. Minority-serving institutions needed to have a unique conference completely focused on their needs. To fill that gap, NACUBO, PVAMU, and SACUBO partnered to create The Business of the University Conference. Held annually in Houston, speakers from historically black colleges and universities and other minority-serving institutions from across the country share some of their best practices with attendees. They tell their stories, explaining how they became successful at dealing with limited resources. We have a different theme for the conference each year. For instance, the first year we focused on business processes. Presenters discussed the importance of mapping a process, eliminating additional steps, and ensuring proper checks and balances. As a result, Prairie View has implemented a lean business practice model, with the goal of involving no more than three people in a process. Previously, we might have had 10 people participate. Now, the goal is for a process to only involve the creator, the reviewer, and the approver. We might not be able to meet this goal every time, but we try. Explain the financing plan for PVAMU’s new football stadium and field house. Alumni took up the charge, through our Prairie View Foundation, to raise funds to build the new $63-million football stadium. We came up with a cash down payment of 20 to 25 percent and financed the rest through tax-exempt bonds. The project required the hard work of everyone involved, and we opened the stadium in 2016. How has the university managed to add student housing without acquiring debt? For more than 20 years, we have used a public-private partnership—also known as P3—for student housing. Through our partnerships, we have added 4,300 beds with no debt. We share housing revenue profits with our partner. Every year, our housing is at 100 percent occupancy, and we always have a waitlist for students who want to stay on campus. When you renegotiated the dining contract, you saved money for the university. How did you manage that? That was the result of competitive bidding. We knew that we were in a good position because our enrollment was growing. Students who live on campus are required to have a dining contract. There are 4,300 students who live on campus, and we also have 1,000 students who live off-campus who sign up for dining services. Because we bring traffic to our dining program, we knew that we had an attractive contract. We leveraged our competitive edge and saved money. What is the “4Cs” program, and how does it help the PVAMU community? I instituted the program, which focuses on service excellence, three years ago. The 4Cs represent customer care, communication, compliance, and commitment. Our customers are internal and external: students, faculty, and others. We want to be effective communicators, listen to what our customers have to say, and address issues or concerns in a timely manner. We want to follow all rules, policies, and laws, and help our departments stay in compliance. We are committed to going above and beyond to help meet our institution’s mission of teaching, research, and service. Implementing the 4Cs program allows us an opportunity to do that. Describe a turning point in your life that led you to where you are today. I was in my preteen and teenage years and going through a difficult time at home. I grew up in the inner city in a single-parent home. I could either take school seriously, or I could let it be an afterthought. I was at a critical stage. During that time, my principal was a former Tuskegee Airman by the name of Charles White. Something he said motivated me to take school seriously. I can’t remember his exact words, but I remember looking up at him and thinking, “I want to be successful just like him.” It goes to show how a single person can shift the course of your life. How can other business officers, particularly minority business officers, achieve prominence in their fields? What steps should they take? First, hard work is key. There’s no substitute. Second, you have to be a people person. You need to be trustworthy, courteous, and have integrity. Third, you need to develop leadership skills, so that you can effectively delegate important tasks and get everyone on board with accomplishing strategic goals. Last time I danced: With my wife on our 25th wedding anniversary last May in Hawaii. Last game I played: Basketball with my high school-aged twins. They won … I used to beat them when they were younger. Last purchase: Plane ticket to Panama City, Fla., for a trade mission with a Texas delegation. Last mistake: I moved my daughter’s car—it was blocking my car—and then I took her keys with me to work. She couldn’t go anywhere, and she wasn’t happy. Last thing I do before leaving for work: Kiss and hug my wife. Last time I was frustrated: When my sports team, the Houston Rockets, didn’t win the NBA playoffs. They lost at home to the Golden State Warriors in Game 7. Last indulgence: On my trip to Hawaii, I had a pineapple upside-down cake that was outstanding. I still remember it. Last time I felt like a kid: On my birthday when my office staff surprised me with a party.